Bill Crecelius has written a straightforward, practical guide for those who seek to establish themselves in Vipassana meditation. He is an experienced Vipassana Teacher who was one of Goenkaji s earliest Western students. Drawing on his own long experience in the practice, A Meditator s Handbook is full of encouragement, homey examples and vivid illustrations. It contains a wealth of sound friendly advice. It is recommended for any Vipassana meditator, and especially for those who have just started practicing. I have learned how to keep my practice together and make it grow. I would like to share this with you. First as a single man living in an area with no other meditators, then living in an area with many other Vipassana meditator friends and finally as a married man with a Dhamma partner, I adapted my life to one of living in the Dhamma. The path of the monk is high and lofty. It is said that the path for the monk is clear and smooth and easy to walk on. It is high above the muck and mire. There are no stones, pebbles, sharp rocks or thorns. Unfortunately for us poor householders this is not the case. Our lives are bound up in worldly responsibilities, jobs, family ties, and mortgage payments. Unlike the monks, our path is full of worldly impediments and distractions. It is for this reason that I think A Meditator s Handbook might help Vipassana students on their walk along this path of purification. Click here for the multi-format eBook (ePub, Mobi, PDF) version. Get the audiobook as separate MP3 chapters. Get the audiobook as a single, long MP3. This excellent book was recommended to me by a fellow meditator at a weekend one-hour joint sitting. It is concise, and powerfully motivates me to think and plan long term; and to keep up with daily sitting with discipline, dedication, and strong determination. I believe I would not have been as regular with daily sittings without this book. And I still struggle a lot. A lot. Initially I downloaded the free pdf version--and found it so wonderful that I went ahead a purchased the book. Highly recommended, specially for those amongst us struggling to keep up with daily sittings. This is a great guide for anyone who has recently started meditating or who hasn't reached intermediate level. Lots of important tips and refreshing basic concepts explained in a different way. So grateful to have completed reading this book. Bill Crecelius offers a clear and practical guide for Vipassna meditation practice. There is nothing to replace one's volition to mediate. That must come first. Reading about another's practice and his experience can be helpful in motivating one to continue the practice or start again. I did several courses (10-days, 3-days, 1-day) and listen to the instructions for group sitting, the talks, etc. However, I really missed a short, practical yet detailed written instructions to fall back on the difficult moments. This book does just that. Thank you, Bill, for writing this book and making it available to those practising Vipassana meditation. I think this is a simple handy guide to your sitting practice right after an introductory 10 day course. Of course, from that point on anytime you want a reminder no matter how far along you are, it helps to keep the book nearby sort of a 911 or a 411 for meditators. I highly recommend this guide and as a matter a fact it only took less than 60 minutes to read the whole text - a small, delightful, quick read!!! I found this book very helpful, with practical advice that helped me understand and overcome difficulties in the practice. In particular it made me understand that I shouldn't have a "prejudice" about what meditation is. I enjoyed Bill's book as it had practical information in it. I would have liked to have had his valuable insights and suggestions after my first course many years ago. I know I'll reread it. He led a course I sat in Massachusettes. He's a warm, supportive person. Very helpful with his advice. And this comes across in his book. Overall, helpful advice for establishing meditation as a regular feature of one's daily life. However, I found one analogy quite disturbing -- knot-making, in fact. In the chapter "A Big Distraction" he compares the affect of dope or alcohol on one's mind to Vaseline smeared on a lens, acting as a filter, a fitting and useful analogy. He goes further, though, and describes how a filtered lens such is used to make a "woman well past her prime, still look very beautiful". Oh, Ugh. Must I read such deeply culturally embedded notions of beauty in a Dhamma book? The flipside of this line is that Young Woman Are Beautiful, Older "past their prime" ones need some filtering in order to make them appear so. This line made me imagine myself "past my prime" -- an imagining I get plenty of help with from the world around me already. I do not think the author intends to promote the idea that I, and millions of other woman "past their prime" (and what is "prime" anyway? 25? 30? 35? 40? Egads.) are not Beautiful when looked at thru a clear lens. However, this comparison led me to spent plenty of (unpleasant) time thinking how, using the author's logic, there's plenty of reason to seek out men with "beer glasses" on if I wish to be perceived as Beautiful. I trust his intentions in writing those words do not match the effect they had on me. But I won't recommend this book and I won't buy another by this author. Ok, I'll admit it. My meditation has been in a slump. I saw this little handbook at an orientation - Day Zero at Dhamma Siri. A long term student recommended this valuable help to me as I checked them in for the 30 day course. One can always learn alot by just volunteering for Day Zeros. Anyway, this little gem of a book has really helped to get me back on track. It also encouraged me to sign up for the next available course. 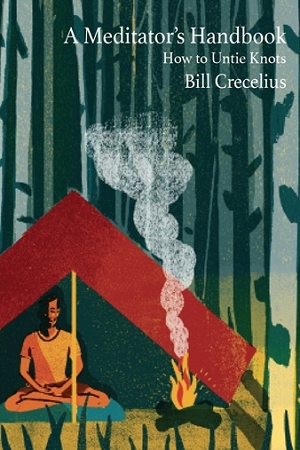 The author - Bill Crecelius was very gentle but firm in reviewing our meditation practice and provided extra helps to keep us focused, avoiding pitfalls, and moving forward always on the path. Only about 91 pages, we will all benefit greatly from this thoughtful book. Mr. Crecelius is speaking from much experience. Much metta to you all.